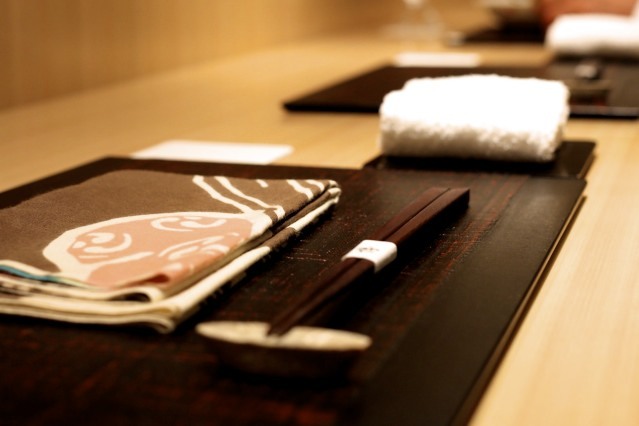 During my culinary research for Japan I came across one particular restaurant that was creating quite a buzz across several social media and restaurant rating websites. 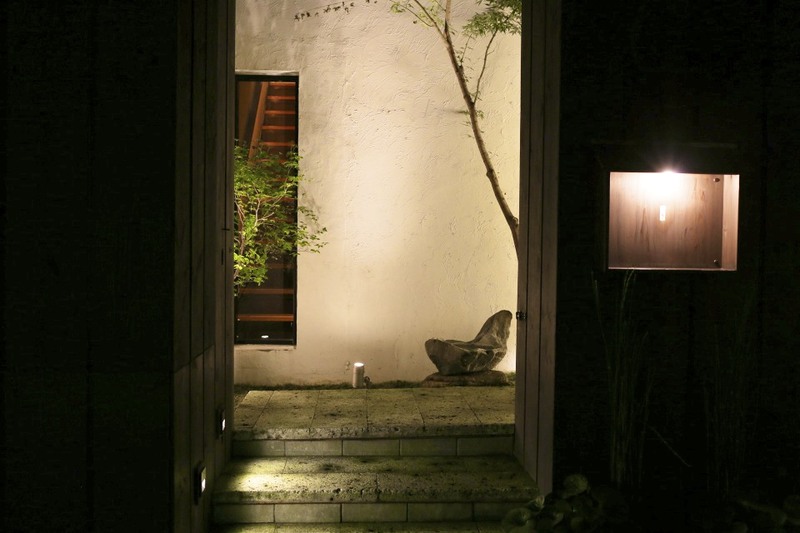 Hell, bloggers appeared to be flocking there en mass, claiming it to be one of the most exciting restaurant in Tokyo. 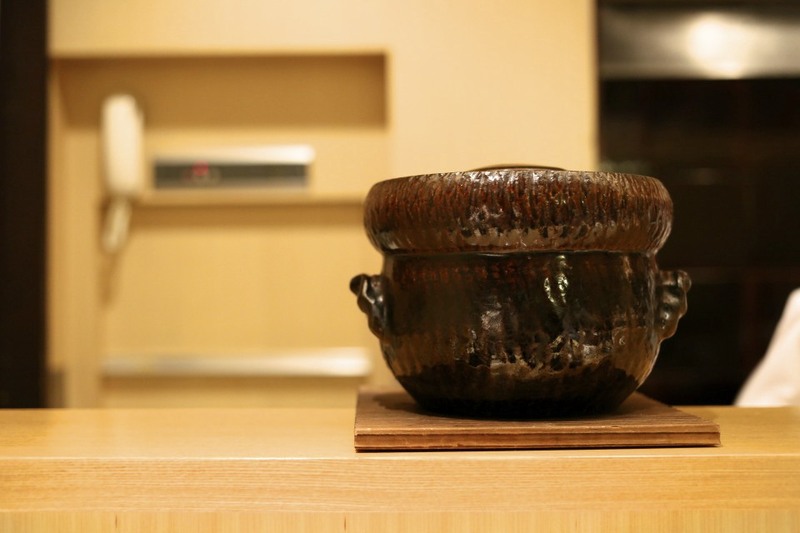 The restaurant was of course Jimbocho Den, opened and owned by Chef Hasegawa Zaiyu in 2007 at a mere age of 29. Since then he made the culinary headlines again for getting his second Michelin star only three years later in 2011. Unfortunately, he was to lose that second star in 2014. The loss of the star, however, does not appear to have diminished the shine on the young talented chef. 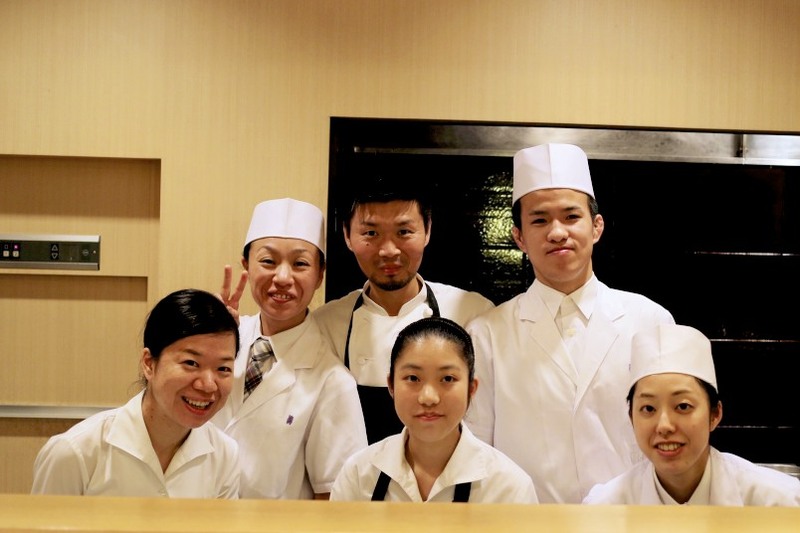 My reservation at Den looked uncertain for a while as Chef Hasegawa, who has a wide network internationally, was planning his overseas trip for the period of our arrival. Luckily we managed to catch him a couple of days before he took off. 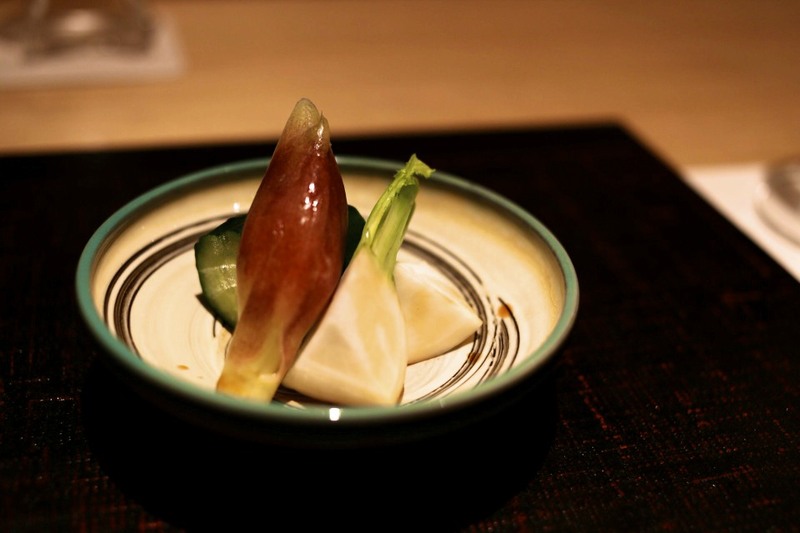 The cuisine at Den was essentially a modern and creative adaptation of the traditional Japanese kaiseki cuisine. 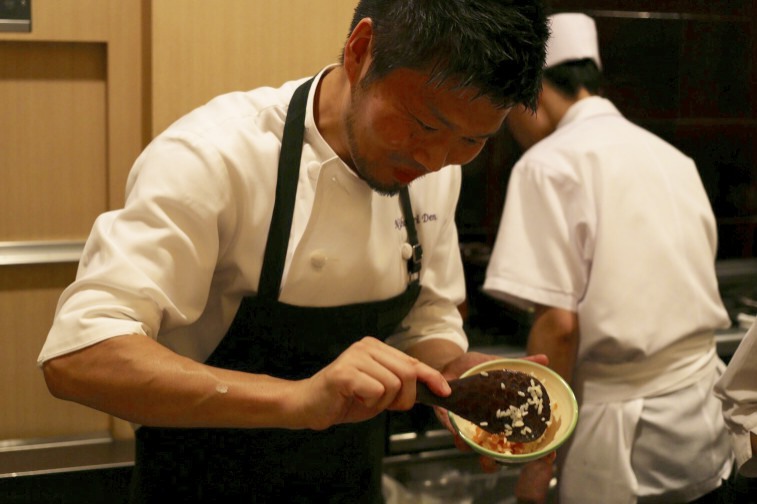 Chef Hasegawa utilises contemporary influences that have shaped the modern Japanese culture as inspiration for his cooking. He is notorious for being creative and inventive, using seasonal ingredients to reinvent classic dishes and flavours. 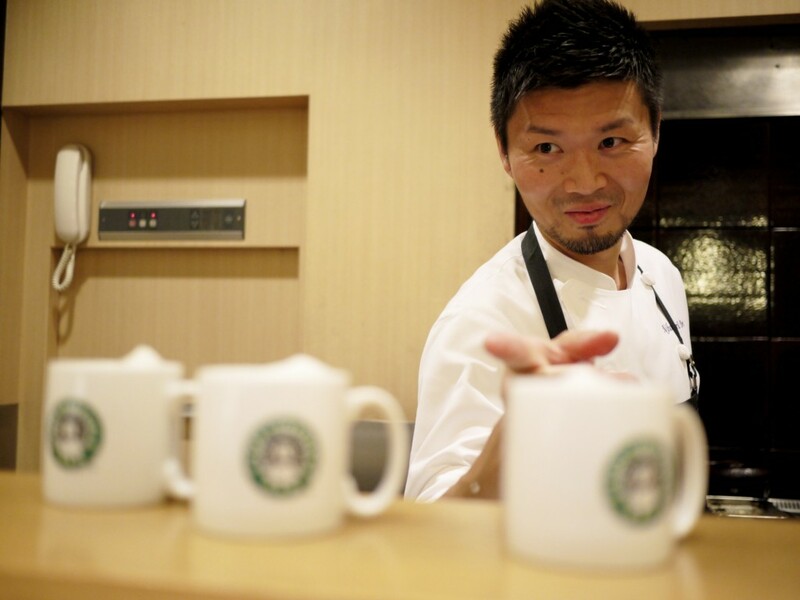 His vision is to create a customer friendly restaurant focused on the happiness of his diners; an inspiration from the Japanese philosophy of omotenashi. 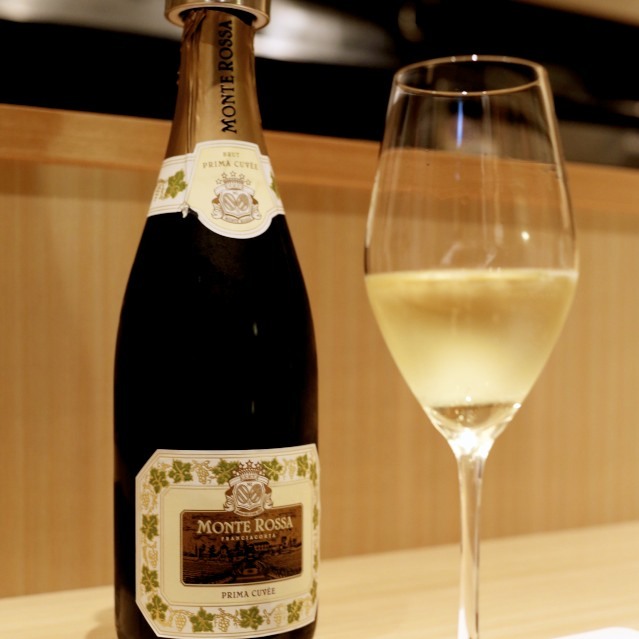 We began our dinner with a rather unconventional but thirst-quenching glass of the Monte Rossa Franciacorta, Prima Cuvee. 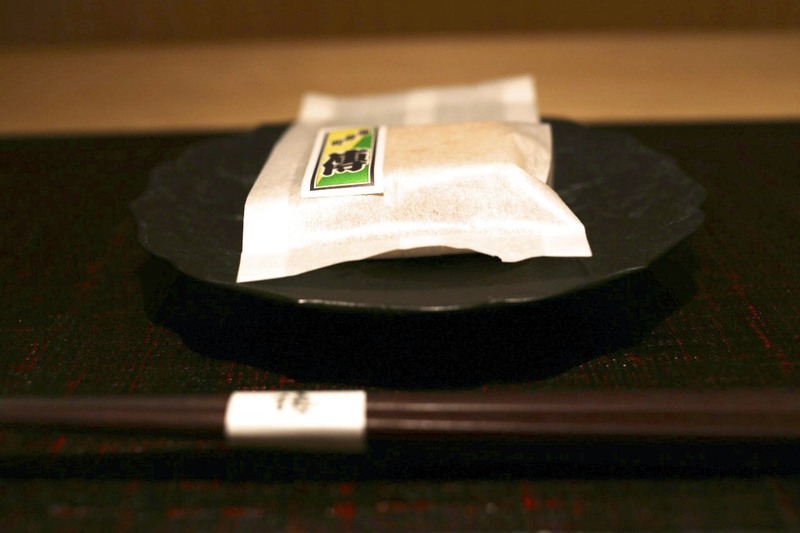 1st Course – Monaka (最中): A Monaka is a traditional Japanese sweet with two crisp wafers made from mochi (rice cake), sandwiching a red bean paste. This, however, was rather different. 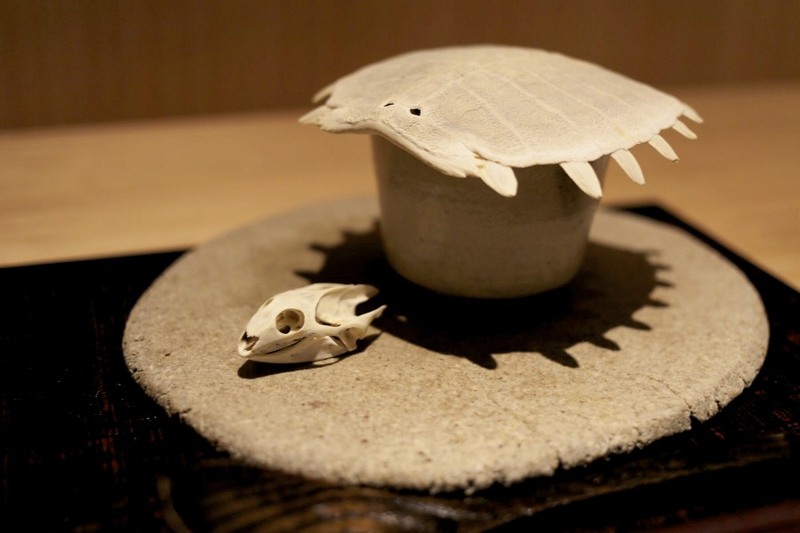 … the skin and meat of the softshell turtle inside. 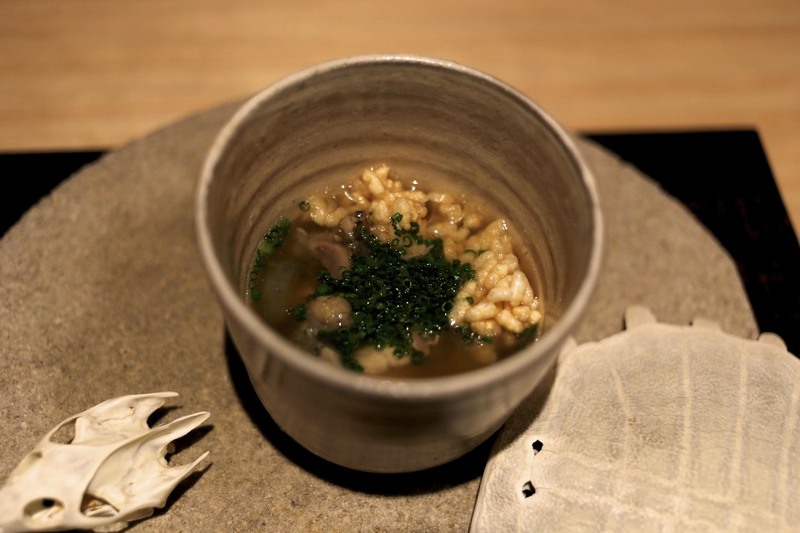 The clear soup, made from ginger and turtle meat, had a surprising depth in flavour and a very clean aftertaste. The rice cracker scattered on the soup provided a nice textural crisp. This was my first suppon and it was surprisingly pleasant. 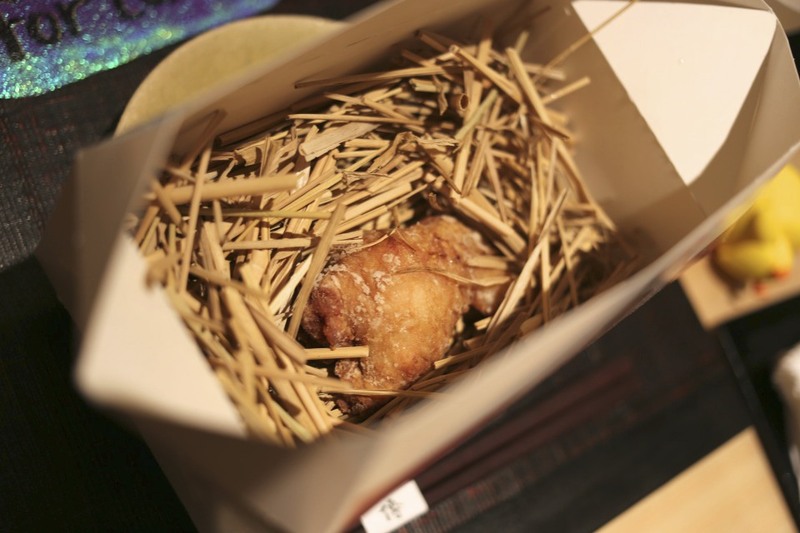 3rd Course – Dentucky Fried Chicken (DFC): We were entertained with another thoughtful and playful dish from Chef Hasegawa. Aside from the obvious humour, the box contained other elements of a personal touch. 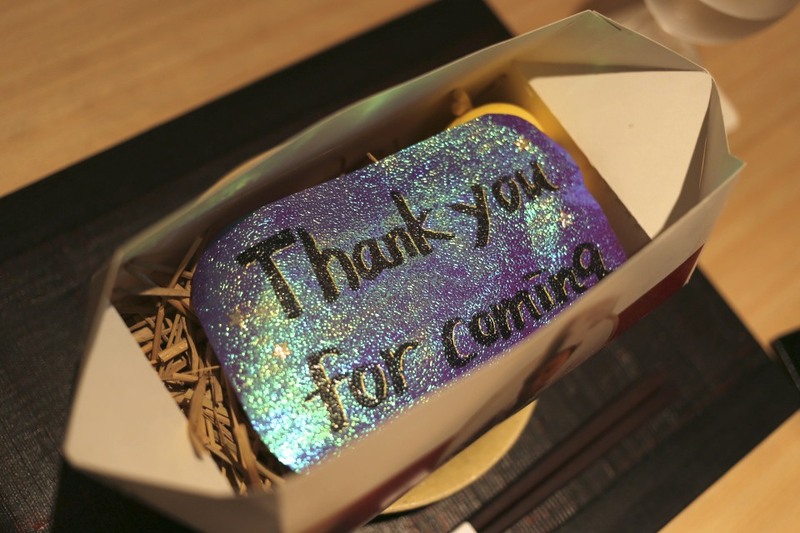 … another personal touch for each diner. I recalled at the time of making the reservation that I was asked about where each diner in my party was coming from. 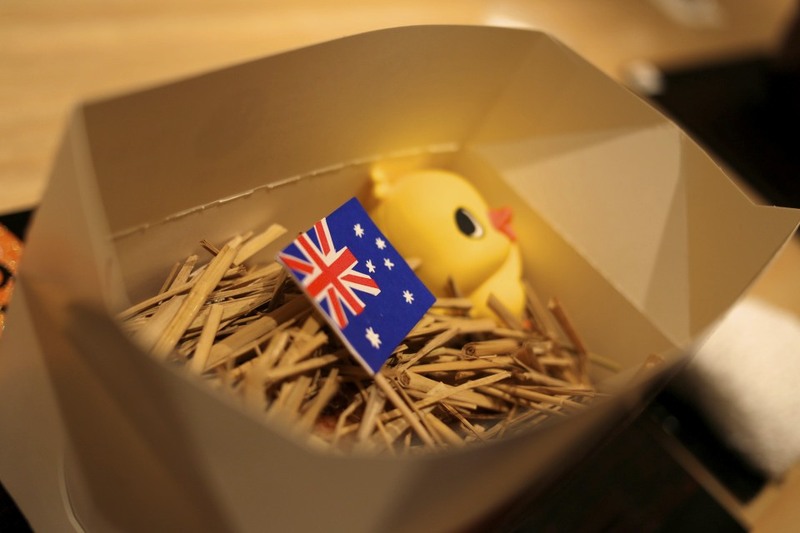 As I was coming from Australia I received an Australian flag and a sponge chicken! Finally on to the food itself. A piece of chicken was nestled under all the prop. The chicken had been de-boned and stuffed like a Brazilian faijoada (beans) but using instead cashew nuts and purée. It was then cooked in a stock made of various meats (including pork) and subsequently deep fried, dried, to wipe off the excess oil, and finally quickly grilled last minute to crisp up the skin. It was a lot of effort for fried chicken… but it was worth it. It was one of the best chicken I’ve ever had. 4th Course – Yellowtail / Buri (鰤) with spicy (karami) daikon: It was a surprisingly oily piece of fish and possibly the best preparation of buri I have ever had. Buri is normally served in the colder months where they become fatter to insulate themselves from the cold water so I was surprised to come across one of this quality in September. 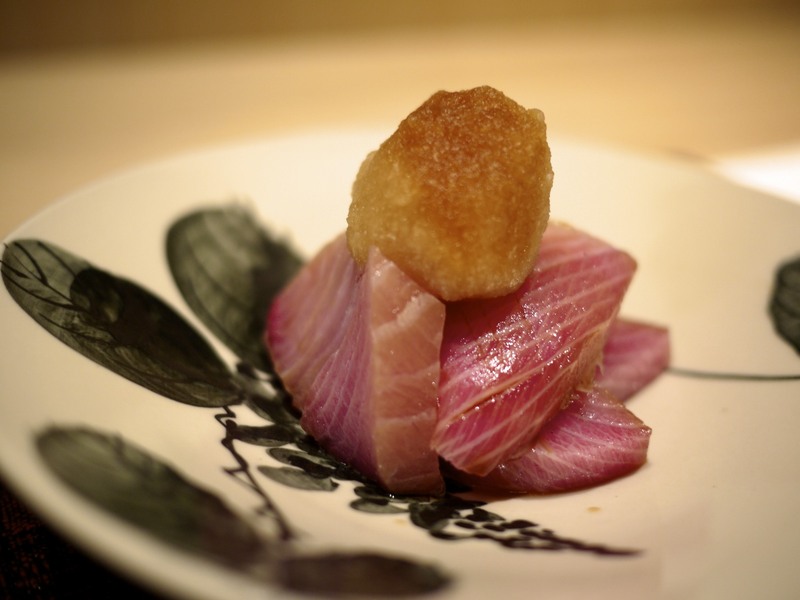 The spicy daikon made from soy sauce and wasabi was a clever component to cut through the oily fish. 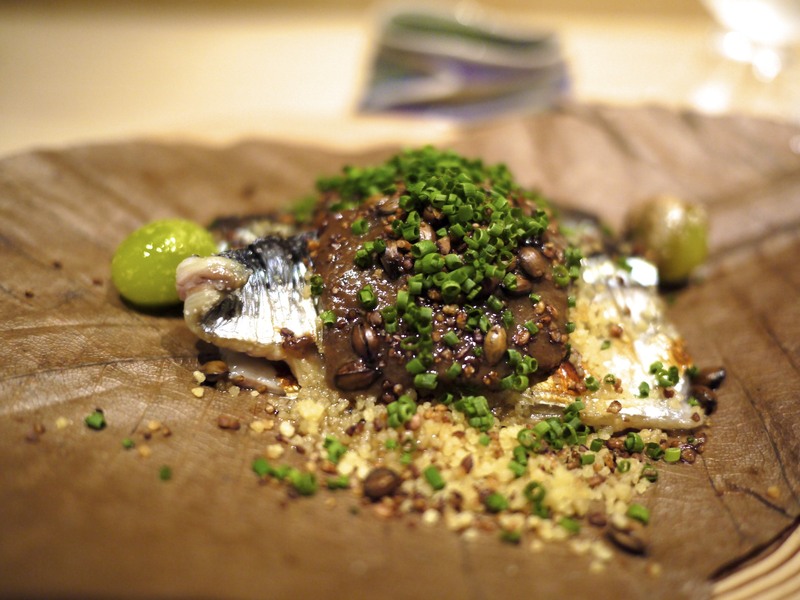 5th Course – Pacific Saury / Sanma Houbayaki: Houbayaki originated from the Gifu prefecture in the mountains. 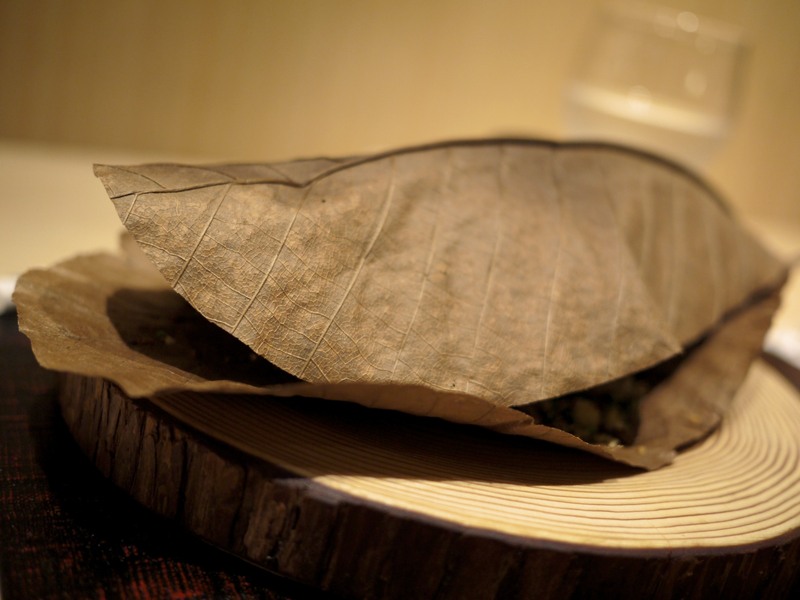 Traditionally a combination of meat, vegetable and miso paste is wrapped in magnolia leaves (houba) and then grilled. 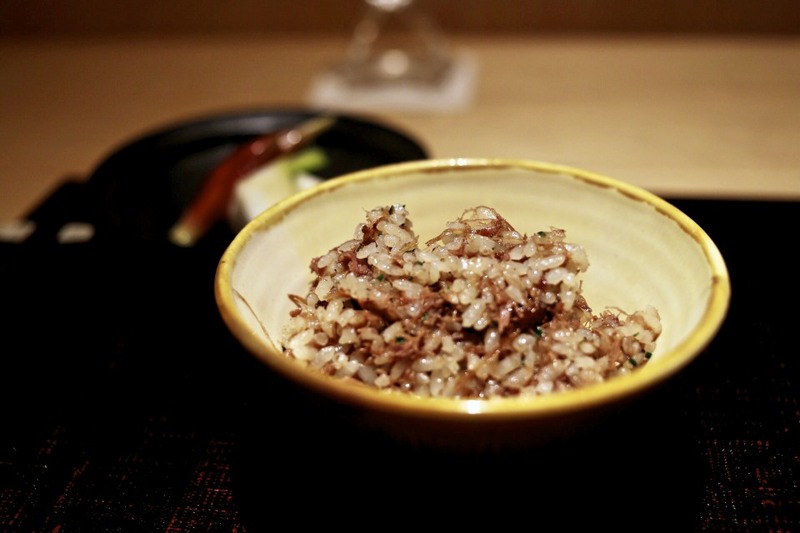 At Den, Chef Hasegawa used Pacific Saury (Sanma) with its liver, miso paste, cous cous, ginko, roasted buckwheat. The combination of the miso and the leaves scent was particularly appetising and the fish was very representative of autumn. Sanma is my favourite grilled fish in Japanese cuisine and this one was just phenomenal. The cous cous, which replaced the rice, was a clever adaptation as it soaked up the flavours better than the rice would have. 6th Course – The ‘Garden’: This was a similar dish to Michel Bras’ famous Gargouillou. 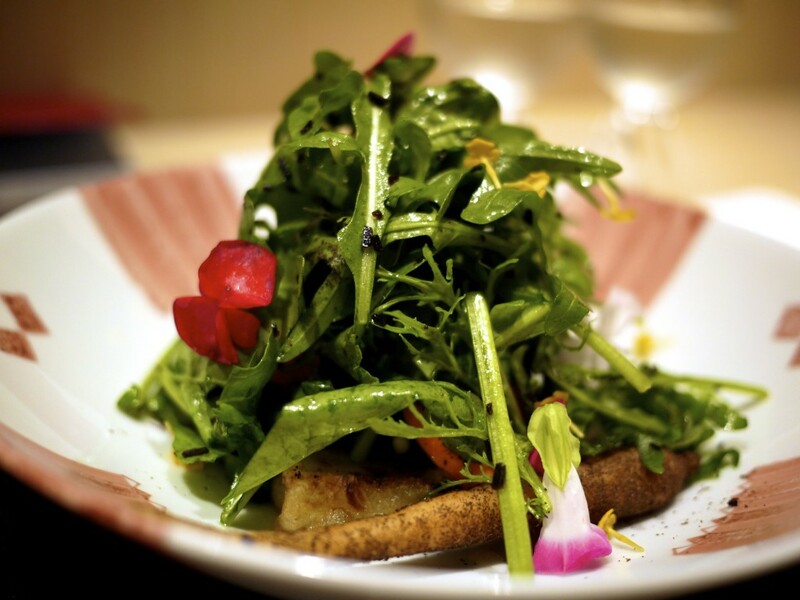 All the elements on the dish was supplied by Chef Hasegawa’s sister who is a farmer. The vegetables were prepared in various ways, some raw, grilled, fried and poached but what made this dish amazing was the sheer quality of the produce. There was rocket, red chard, nasturtium, spinach, begonia and mustard leaves as well as a carrot poached in sweet vinegar (amazu) and covered in houji-cha powder, tomato with a hint of vanilla, mountain yam (tororo imo), burdock (gobo), potato from Hokkaido, pumpkin, edible flowers, radish, turnip, peppers and gingko. 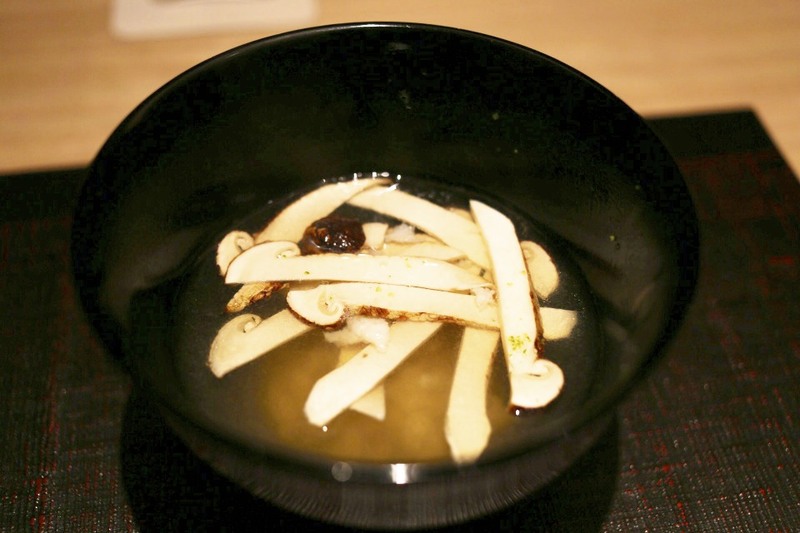 7th Course – Matsutake Soup: Made from Matsutake dashi, conger pike (hamo) with yuzu. It was good, as far as matsutake went, but again I am not the biggest fan of matsutake. I think there are mushrooms that cost a fraction of the price which taste better. Some pickles to go with the next two courses of rice dishes served in a donburi nabe. 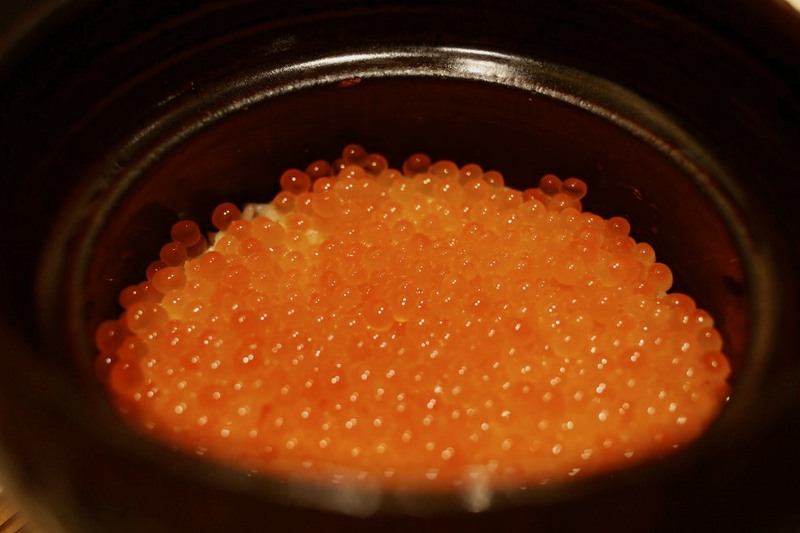 8th Course – Ikura Donburi: The first was hands down my favourite. 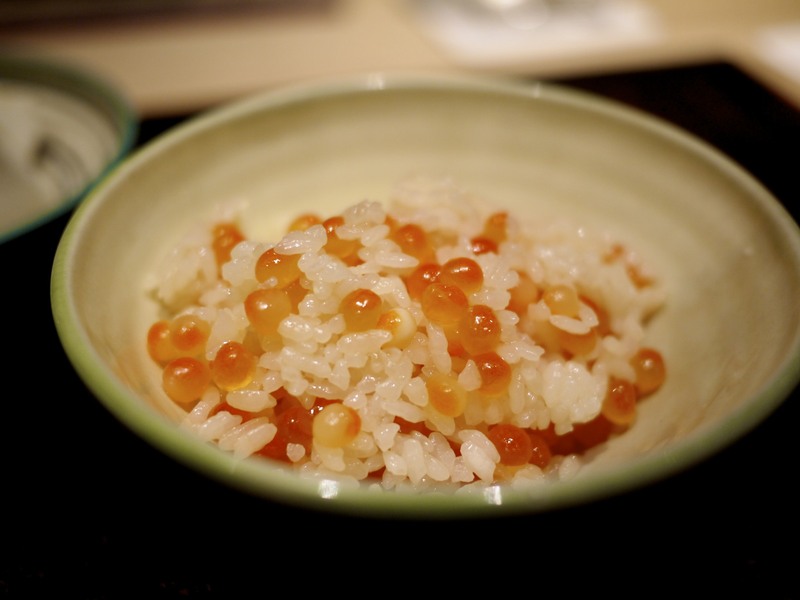 Salmon roe was poached in dashi over rice. I’ve never seen such a geneorous amount of ikura served over rice! I absolutely destroyed this dish and devoured the first serve in seconds. The rice had soaked up that lovely dashi stock and the the gooey juice from each salmon roe went ever so well with the rich dashi stock. I loved how the texture interchanged between the occasional chewy Japanese rice and the pop from the salmon roe, not to mention the generosity of the chef with the portion size. 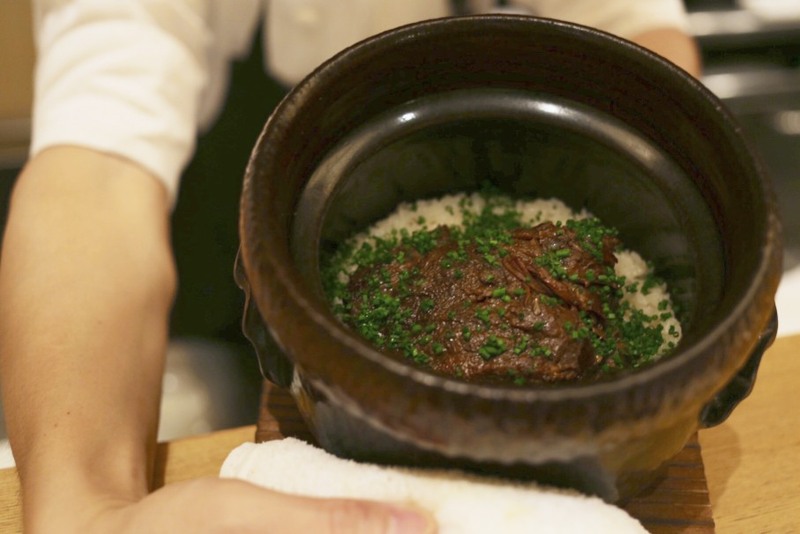 9th Course – Black wagyu cheek donburi: It was another triumph of a dish. 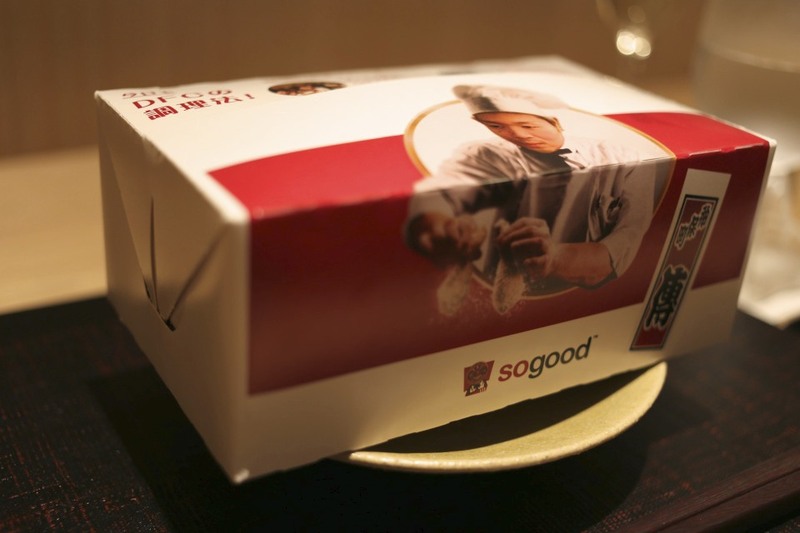 It was very interesting because I’d never tasted something that had such an intense flavour of premium beef without a meaty texture. 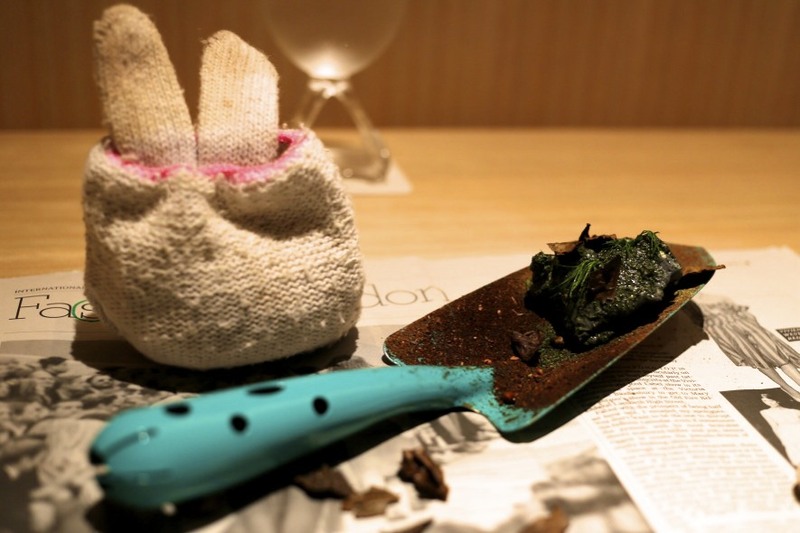 10th Course – Moss from the Garden: More humour from chef Hasegawa. This time he served the dessert course on a garden spade complete with ‘used garden gloves’. This was a tiramisu in a deconstructed fashion made of cheese mousse, green and brown teas and charcoal. I loved the humour in this interpretation of a classic dish. 11th Course – Star Comebacks: A deliciously humorous finale to end a great meal. 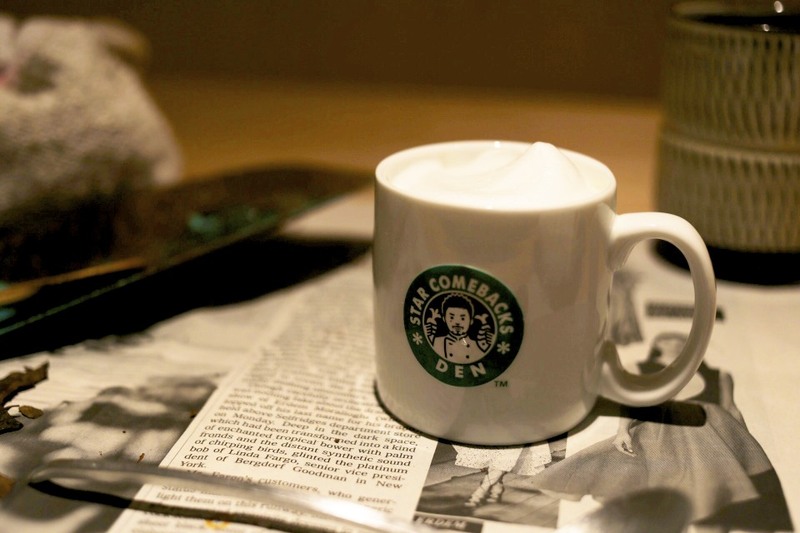 The adapted logo of starbucks was used to express the chef’s humour in trying to get back his second Michelin star he lost in 2014. I liked the fact that he was happy to poke fun at himself. 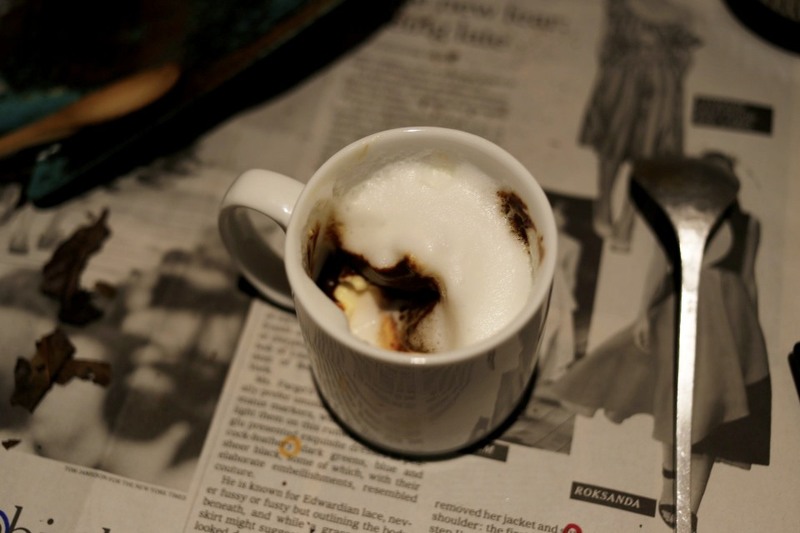 The content of the mug was what appeared to be a cappuccino at first glance but was actually pudding and sugarcane. 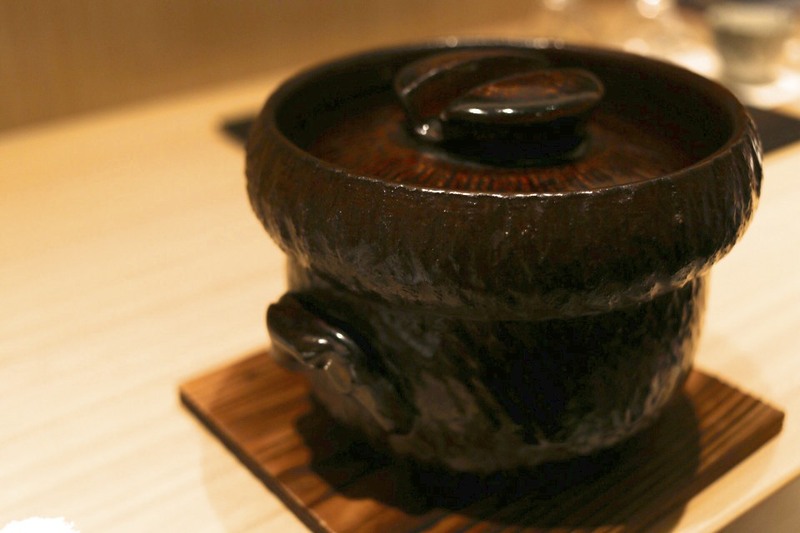 The dish took seven hours to cook to create a thick caramel before a layer of custard and black truffle from Australia were added. It was a very adult flavour of bitter and sweetness. 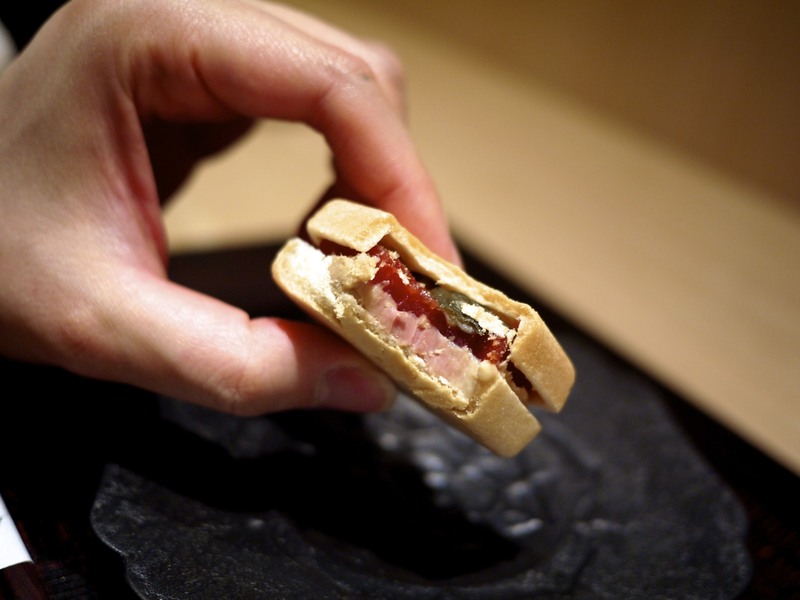 Short of 15,000 yen for a tasting menu, Jimbocho Den was definitely value for money in the fine dining scene in Tokyo. Add that to the consistently high calibre of dishes that came out from the kitchen and you can understand why Den was so popular. What personally attracted me equally was the professionalism and focus of the team in their disciplines as they effortlessly managed to make each diner feel personally welcome. This level of omotenashi was definitely not something I found readily in other establishments, even as a Japanese person. Den to me represented a new generation of Japan. This entry was posted in Japan and tagged Den, Hasegawa, Ikura, Jimbocho, Jimbocho Den, Modern Kaiseki, Suppon, Tokyo, Zaiyu on January 17, 2016 by admin.